You are such a good sport! I'd be much more upset - although the cut looks really cute on you. I've had the similar situation where "just a trim" turn into fringe cut in twice as thick etc. Amiable, You are an exceptional person! Brava for not being upset by a (perhaps less than ideal) haircut. Your face is lovely--your smile radiant--your talents many. I aim to be more like you! you are amazingly zen for this. I once asked a friend in university to trim my then waist-length hair. She cut it above my shoulders because "she thought it would look better". I was so upset! I am sorry you didn't get the cut you wanted! It hopefully will grow fast for you. I've said it before, and I'll say it again. I just love someone who doesn't take themselves too seriously! It's not the best cut in the world, but the good news is, your head's going to be so frigging cold, you'll be wearing a hat for the next couple months. It's only hair, it'll grow. For heaven's sake, you've got to spend more than $8 on haircut next time! To be honest, to me it really is only hair. Luckily, my hair grows rather quickly. I knowingly went to a cheap place where I knew it was a risk, and I ignored a host of bad-feeling type "signs" - a closed road on the way, parking problems, the waiting room filled with somewhat "unsavory" characters, the stylist being quite late in getting to me - despite her being not being with another customer. It isn't the haircut you wanted, but it looks nice! I think you can have a lot of fun with it making it chunky and piecey and a little punk, kind of like how Angie makes hers all piecey instead of allowing it to lay flat. Yours I would see laying flat, but with piecey bits winging out around the sides and back. Do you have any styling wax? Aveda makes a great one--light elements shaping wax--which works well for us gals with lots of finer, straighter hair. I can't tell you how to tell whether you are getting a good or bad haircut when you are getting it. My current gal absolutely defies logic in that way. I see huge chunks of hair falling. Giant pieces cut out of nowhere. Craziness. If you saw what I saw, you would think you were getting the disaster haircut of disaster haircuts. It always looks amazing when it is done, though, and it always looks as good or even better as I style it throughout it's 6 week life. I am convinced she is absolutely magic. So, no idea how to tell whether it's good while it is going on. But I sure can tell whether it is good afterwards! When I was in college I wore my hair super short, and punky. In my early 30's I decided it would be good to wear it that way again, well, it wasn't. I knew was soon as the deed was done, it was a mistake. Now, the cut was good, but it just wasn't right for me. But your right, what are you going to do? It's hair, and in a few months it will grow back, and you start again. I'm so sorry! Yes, they did cut it quite short in the back, didn't they! I'm glad you have such a good attitude. If you really need cheap haircuts, I have found Cost Cutters to be the best quality for the price. Their adult cuts were $15, at least a couple of years ago. I've had varying degrees of satisfaction with the cuts, but none of them have been bad. You can also sign up on the website for haircut reminders, which will give you $2 off your next haircut, I think. I have had a horrible time at Great Clips. I had a coupon for a $5 haircut one time, and the haircut I got wasn't worth the $5! 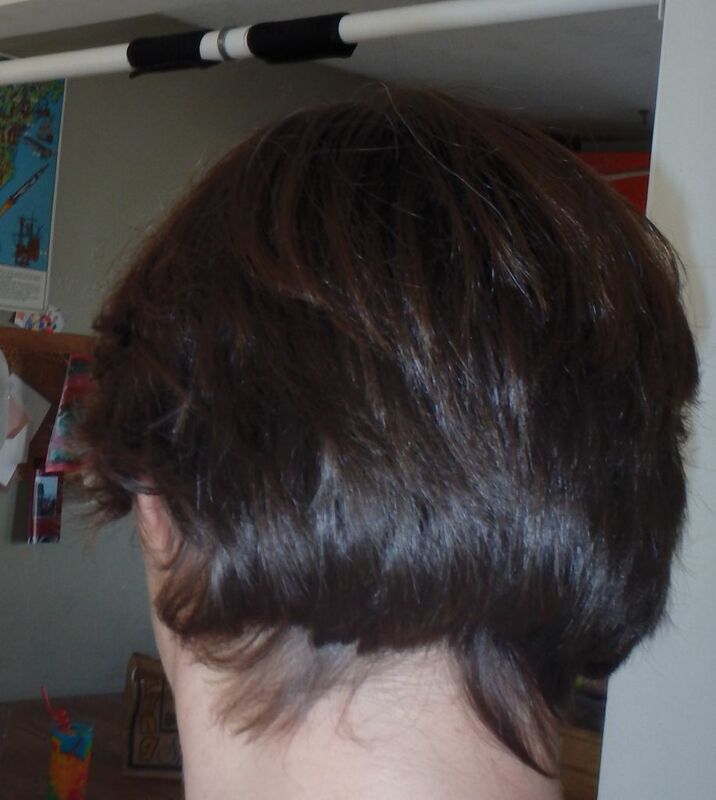 I complained about Great Clips to the Cost Cutters hairdressers, and they all nod their heads and say, "Yup." Apparently Great Clips really rides its employees to get cuts done really fast. People leave there to go to Cost Cutters so that they aren't so pressured. The workers don't feel good giving those horrible haircuts either! I now go to a medium-price salon ($38 for a haircut), but she does such a good job that I can go for nine weeks between cuts rather than just the five or six with a Cost Cutters haircut. So I figure that is worth the extra money and less hassle. You calm, delightful person, you. Of course it is only hair, but it is frustrating when you are paying for a service and don't get what you asked for. You were very gracious! The crying stylist almost did me in. The after looks a bit like Jennifer Lawrence's pixie to me. I bet you'll have fun styling it! I love your zen take on this! You're right sometime an $8 haircut is great and sometimes it isnt so great but I think this will actually grow out ok. And winter is hat time! I like the new hairdo! And oh yes, I've had some bad ones myself. Let's see, there was the time the brand new stylist (who just happened to be my sister-in-law) was coloring my hair, and in a panicked manner called over about two or three others...I ended up with hair a lovely shade of green that time. Then there was the time a friend's mother colored my hair, and in a frantic voice said, "Quick! Go wash it off!" And you guessed it, more green-hued hair. Needless to say, I found myself a "real" stylist who knows how to color hair, and I'm sticking with her. Gigi - this wasn't a chain, it was a small local place. I do have a Cost Cutters nearby - think I'll try them next time I need a shape change that's beyond my cut-my-own-hair skills. When I was a stylist one of my co-workers was sued in small claims court for cutting the ladies bangs too short. I don't remember the outcome of the case. I'm sorry you didn't get what you wanted, but I think it looks cute! And like you said, it'll grow out. I'm amazed they got the back that short/high at the nape with scissors! It wasn't what you went in wanting, but I, too, think it looks good. And yeah, hat/scarf/cowl for the neck. Brr. Amiable: You are so amiable and such a role model! Thank you! For an inexpensive cut, you might also want to consider cosmetology (beauty) schools. The teacher comes around to check and may show the student the initial angle, etc. Maybe others will chime in on how to find the most talented students and best times to go. Years ago when I was a poor student, I used to get my hair cut at a Vidal Sassoon academy where licensed, experienced, and generally upscale stylists would go to learn the Sassoon style which was very big at the time. I could still go, but the look doesn't appeal to me any more. You are a real trooper, Amy! However I am with Angie: it may not be a stellar haircut but it is not total disaster either. Give it a week or too and use some product to increase the texture and you may even like it! Amy I have nothing but respect and admiration for you. I would have gone ballistic lol. As it turns out the cut actually looks really good. The course of events you describe would have sent my stress levels spiraling. I particularly love it from the front. Going to the hairdresser should be a relaxing and enjoyable experience and the fact that you tipped the stylist demonstrates you are truly a gracious woman. Amy you are truly a rare soul! Such a wonderful attitude! Anyway I am with Angie and I think this is going to grow on you (ha ha). Don't judge it for a week or two. I had too much taken off the back also recently, and I thought too much left in the front, but after 2 weeks it grew in and I am getting a lot of compliments. Amy dear. The haircut looks cute from front and sides. Just the back is what needs a little feminizing. I agree with Angie. In four weeks it will be perf. I've had a rather nasty day, and I was, literally, just breathing and praying for resilience and grace. Then I read your post! Your flexible spirit is a thing of beauty --- worth more than a $100 haircut! Yeah, the back is short, but the face framing is good, and your hair is bouncy and shiny. I second a little hair wax around the face! Oh, and thanks for giving me a reason to smile at your fabness! I think you're a good sport Amy - truly! And I honestly don't see a bad haircut, just a really cute, short cut which you will rock! 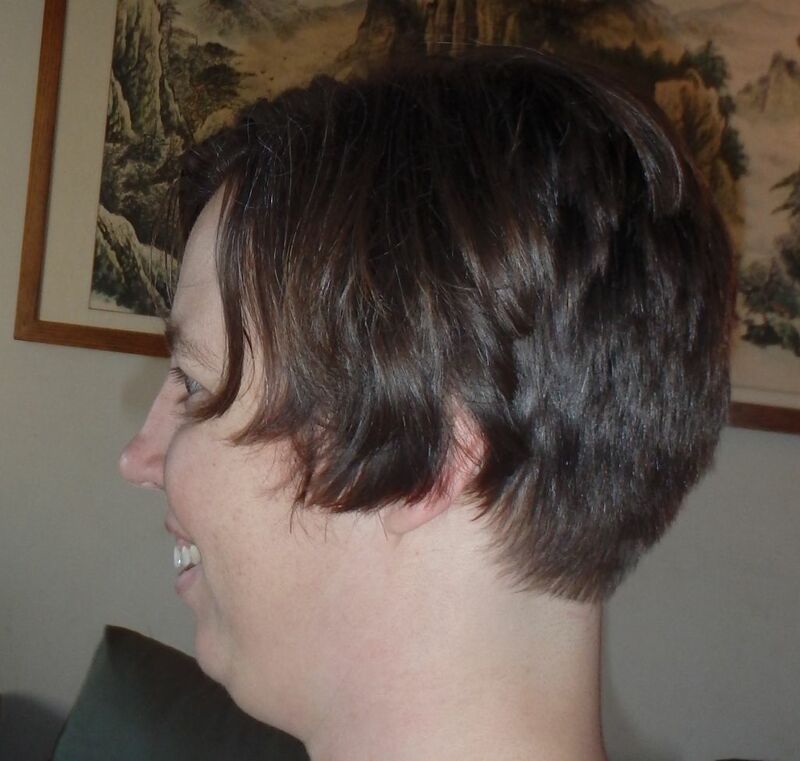 I've had some disasters myself, the most memorable of which was a very rash decision to cut my hair very short with a hairdresser I had never been to before just 2 days before my daughter was born. I look back at her new born pics and wonder what I was thinking. And the stylist should have known better than to make such a huge change on a 41 week pregnant woman! Amy, what everyone has said! You look fine to me and I love my hair short in back - it looks like you have a high hairline anyway. You are amazing and I need some of whatever you're having that makes you so amiable! 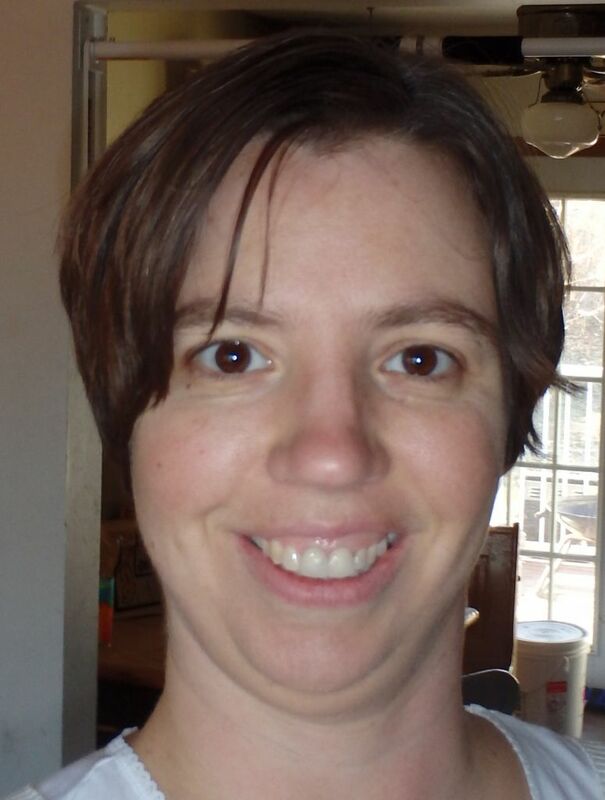 I love your attitude, Amy, as well as your new 'do. While your new cut might not have been exactly what you'd wanted, I can certainly see you warming to it because it shows off your pretty features so well. Your decision to leave the young stylist (?) a tip was wonderful; not many people act with that much restraint and class when something doesn't turn out exactly as they had expected. You are pretty fabulous inside, as well as outside. Lol, Ames, you have a heart of gold. A lesson for us all. I think the front and sides look great. Popped collars or turtlenecks will hide the shorter-than-you-wanted back until it grows a little. During one memorable hair appointment the new-to-me stylist fluffed my hair this way and that, lectured me on the impact of a conservative, dated style, pointed out my good features that were not being flattered, and, after several minutes of parting and brushing, grew silent and visibly tense. He finally exclaimed, "I can't do a thing with your hair! " I asked him to just trim the split ends and clean up the lines of my cut. Apparently he felt that he had accomplished the task a few minutes later, because he walked off. I waited in the chair a few minutes, decided he wasn't returning, took off the smock, cleaned the hair trimmings off my neck as well as I could, and went to the cashier to pay. She asked me if I wanted to book my next appointment with the stylist and I told her that he had shown no desire for me to return. 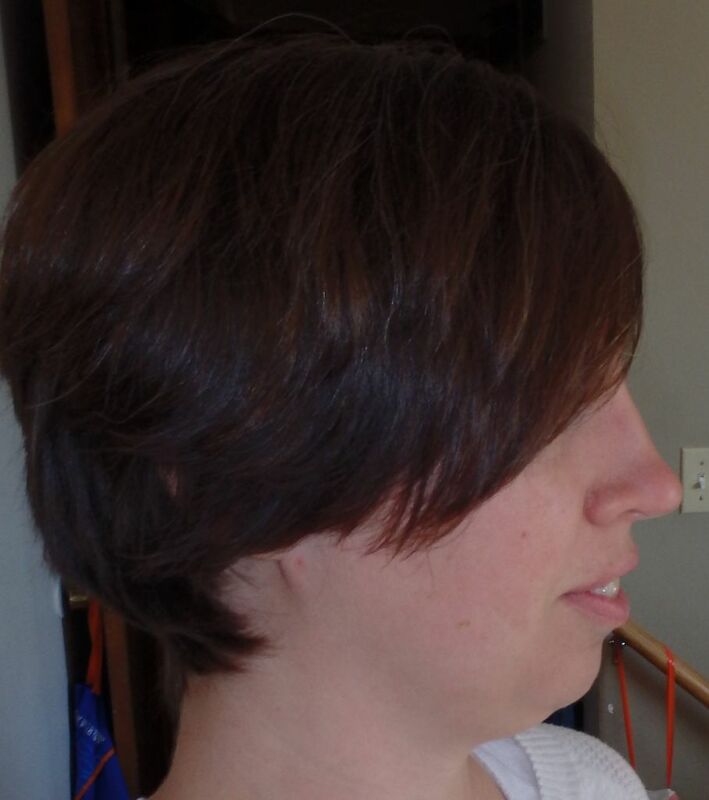 I left the shop, which had a good reputation and charged higher prices than I was accustomed to paying, with my hair in the same "unflattering" "dated" basic bob that the stylist had derided half an hour before. I wish I could come around and give you a hug!! You are such a sweetheart! I might have been boiling and stomping my feet! o_O I have a serious inferiority complex now! LOL! Oh no! You have such calm and grace. This story made my day. 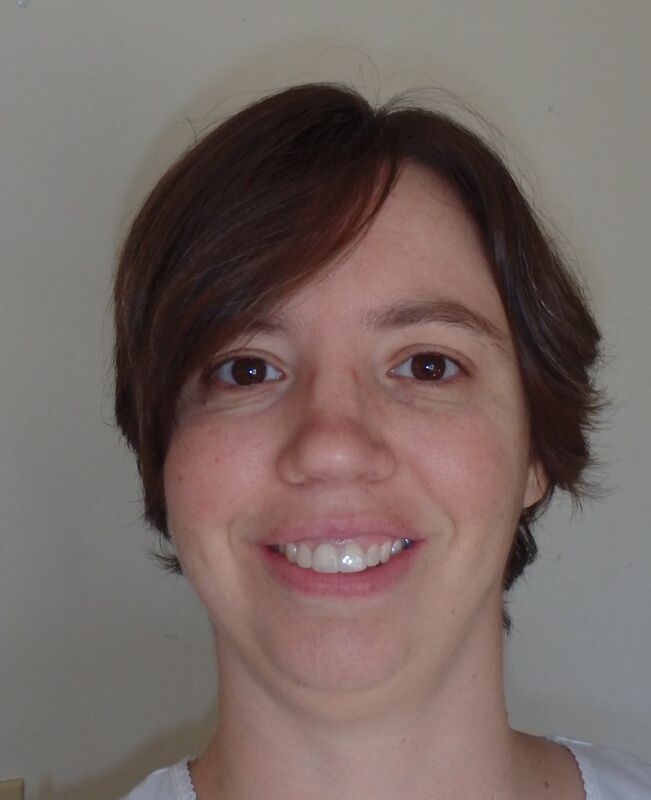 Once when I was growing my hair out from a pixie to long, I'd finally gotten the shortest bits about mid-neck length. 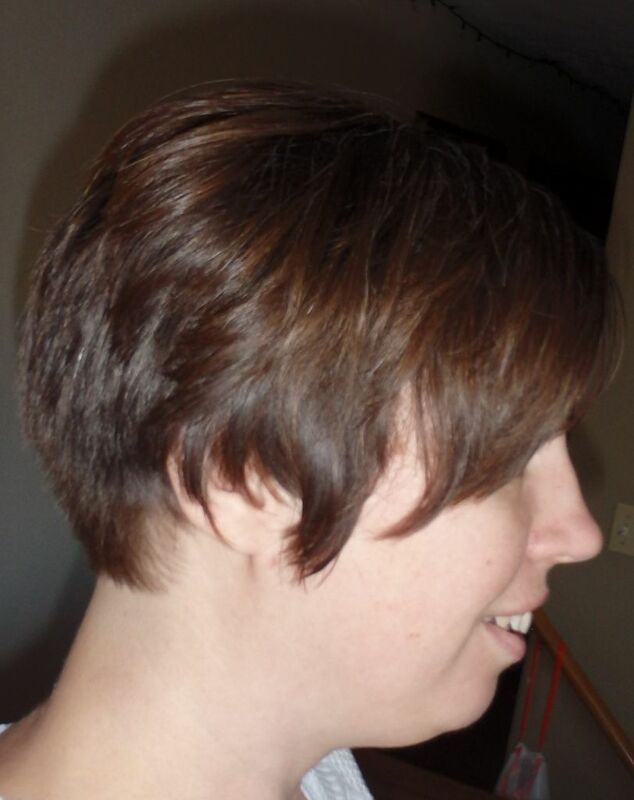 So I went in with a bunch of pics of blunt longer bobs so that the hairstylist would just trim up the old pixie layers and make it all one length. The bobs also had bangs, because I thought it would be fun to try bangs. 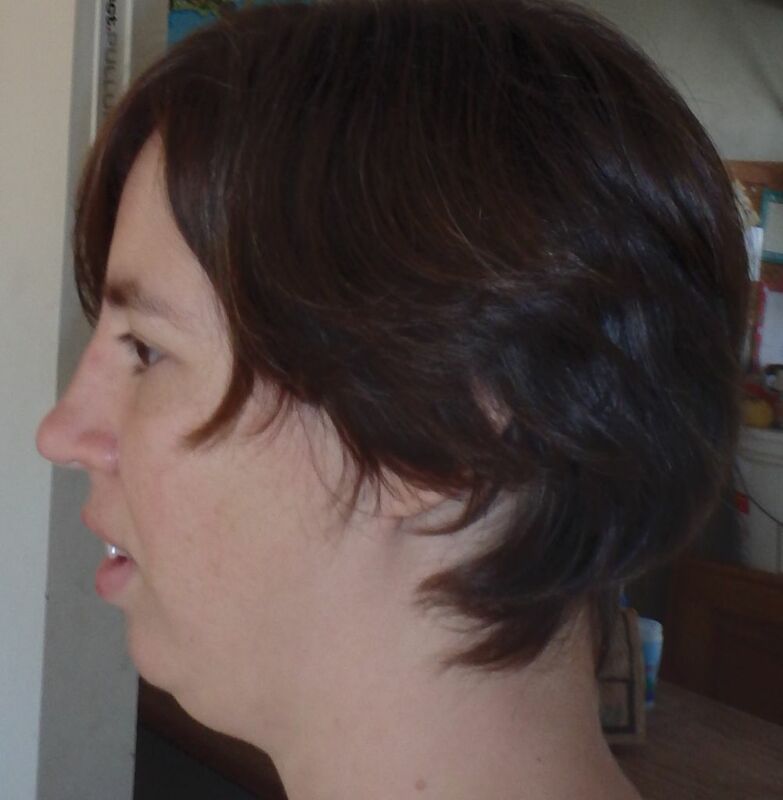 Somehow, this stylist interpreted that to mean in addition to bangs I wanted all of these face framing layers, which looked hideous on my face and made my hair look flat and thin and stringy. The shortest layers hit at my cheekbones. I was inconsolable thinking about how long it would take to grow back; there was definitely a lot of sobbing. And that was not at a super cheap place! I've found hair cuts to be such a crap shoot, regardless of cost. You get "Best Attitude of the Year" Award Amy! Seriously, it is truly admirable that you didn't get visibly upset when you were not given the cut you asked for. But like Angie, I actually really like it on you! I think it suits you and you have quite a beautiful neck so why not show it off! Sorry Amy, but I don't think your description matches your pictures! I think this cut is cute, even if it wasn't what you were expecting :). Give it a couple of weeks, and you will be feeling it! I want to be you when I grow up. Oh wait...I am 43 so I guess it is time to grow up. Seriously I want to treat people the way you treated that lady. That is the best holiday present EVER! Maybe you need some of Angie's hair styling creams/gel and get it all sticky uppy (that is a word right). 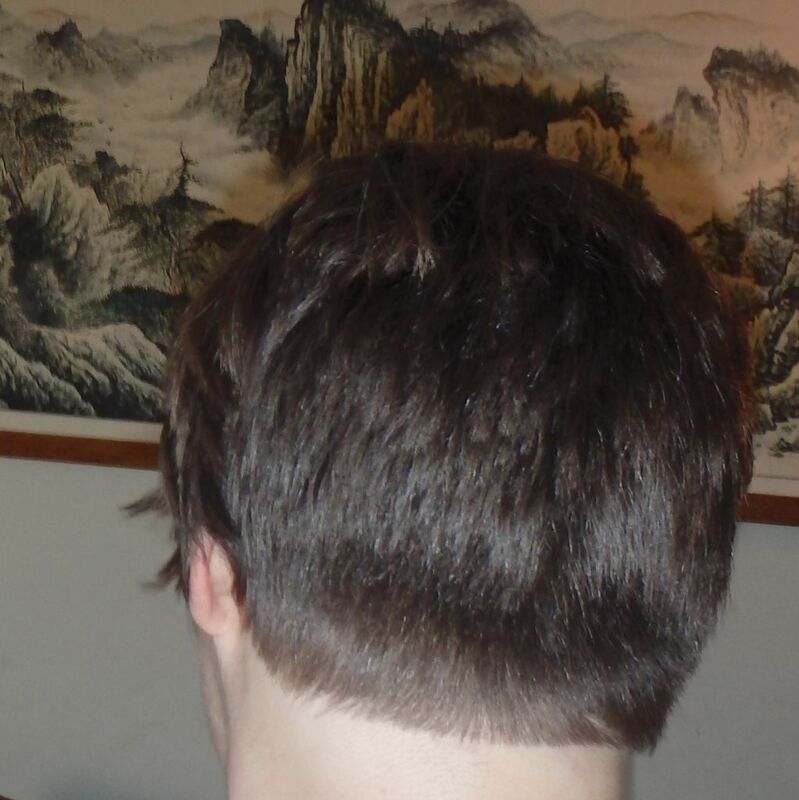 I think your hair cut (in the front - cant tell about the back) is really cute. Not what was planned but cute! Amy, you really ARE amiable. What a trouper! And what a gift you gave that stylist with your attitude. I'm also with Angie. Heck, my own hair is that short at the back -- and I like it! Once it grows in a little bit it will follow the shape of your head a bit more and I think you will actually enjoy it. Well don you for such a great positive attitude. but you know what? It isn't all that bad. I like it! I think in a couple of weeks it will blend beautifully.